How long will the cool rooms and wine rooms last? After 25 years, we still have customers using their coolroom or wineroom. We carry parts for the components with the cooling unit more likely to require servicing or repair. In rare and extreme cases, the cooling unit can be completely replaced and this has only happened after 15 years of use. What is the warranty on the cool rooms and wine rooms? What pre sales support do you offer before purchasing a cool rooms or wine rooms? All enquiries (regardless at what stage they are at) will receive full pre sales support with no obligation. We encourage you to get us involved at a very early stage so we can advise you accordingly and ensure your cool room or wine room looks part of the build. We will work with your Architecht, Designer, Builder, Cabinet maker and even your Electrician. How discreet are the cooling units? This is one of the attractions of our cooling units. Not only as they super efficient built to Norwegian quality, they are very compact and discreet. The Thermocold unit are the most discreet cooling unit of them all is thinner at only 250mm deep x 750mm high. Only vents are required on the other side of these cooling units. Does the cooling unit have to be on an external wall? Not all all. Our cooling units are designed to be wall mounted on an internal wall and does not need for any drainage. Only standard 10A power point is required nearby for the cooling unit. All our coolrooms and winerooms only require a standard 10A single phase power. The modular and pre built coolrooms and winerooms come with LED light inside. With the custom walk-in coolrooms and the custom winerooms, LED lights are very good, butany light that takes Cool energy efficient light globes (including Cool Fluro) can be installed. Halogen lights must be avoided they are too hot. Can you supply glass or stainless steel doors in the cool rooms and wine rooms? 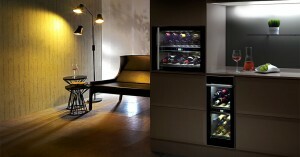 All wine room products including the WineFridge, Winerooms and custom WineCellar have a glass door as standard. In some cases, you can choose the door trim to be either white frame or brushed stainless steel. The FridgeDrawer and the CoolCorner is available with stainless steel doors. 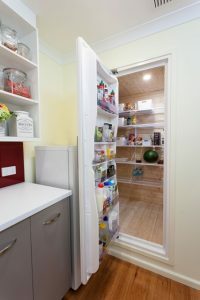 In the CoolPantry range, three of the models, the door can be integrated and in the Custom Coolroom the door is fully integrated. Can the cool rooms and wine rooms be integrated? The beauty of our coolrooms and winerooms is they can integrated for that seamless look. The outside walls and in most cases the doors, can be fully cladded by your cabinet maker to match your cabinet work. Can the cool room be converted into a wine room and vice versa? Should you find you need to change its use, the CoolPantry range and the custom Coolrooms can be converted for wine storage by simply changing the thermostat in the cooling unit. Likewise, the WineFridge, Winerooms and and custom WineCellar can be also converted into coolrooms by changing the thermostat. This is because the thermostat in the coolrooms operate from 3 degree C to 12 degree C and in the winerooms the temperature ranges from 10 degree C to 20 degree C.
What temperature do the cool rooms and wine rooms operate at? The coolrooms operate from 3 degree C to 12 degree C and in the winerooms the temperature ranges from 10 degree C to 20 degree C.
Can the cool rooms and wine rooms be custom built? Yes. The custom walk-in coolroom and custom walk-in WineCellar is built on site to any shaper or size. The WineFridge and the Winerooms as well as the CoolPantry range can be ordered as custom built to any size. These are pre-made in Norway so extra time is required from date of order to delivery. For any custom design, it is very important we are involved at an early stage. How are your cool rooms and wine rooms delivered and what installation is required? The custom walk-in Coolrooms and custom WineCellars are built on site (currently WA only) by our trades. It takes two of our experienced trades two to three days to construct a coolroom / WineCellar on site. The FridgeDrawer and WineCabinets are delivered as fully assembled units and ready to be plugged in and go. Where possible, all units are delivered to your home. Alternatively then can be picked up from our couriers depot in the capital city. The CoolCorner, WineCabinets, WineFridge and Winerooms are modular for easily assembly. It should take about 2 hours for one or two persons to assemble the unit. Where possible, all units are delivered to your home. Alternatively then can be picked up from our couriers depot in the capital city. Delivery is to all capital cities and regional areas in Australia – WA, VIC, NSW, QLD, ACT, SA, NT, TAS as well as New Zealand. Also available to South East Asia, including: Singapore and Hong Kong. Do I need drainage or tundish in a coolroom / wine room? How much noise do the cool rooms and wine rooms make? What are the running costs in a cool room and wine room? What are the capacities of the cool rooms and wine rooms? Depending on the model and excluding the FridgeDrawer, the capacity of the coolrooms ranges from 1,000 litres (= 3 normal fridges) to 12,000 litres (= 35 normal fridges). For the winerooms, the capacity ranges from 1,000 litres to 20,000 litres. The number of bottles that can be stored will depend on your wine racking. What kind of food can I keep in a cool room? You can store anything and everything you can in a normal fridge or dry pantry – cereals, cans, meat, fish, fruit, vegetables and even dry foods such as flour and sugar. No more bugs or weevils! Plus, food will always last longer and keep fresher than in a conventional fridge. Our coolrooms are also great for entertaining – perfect for, salad platters, trays of fruit, bulk drinks and white wine. Where do your cool rooms and wine rooms come from? All our products come from Norway. Our coolrooms and winerooms are manufactured by two of the leading companies Norcool and Thermocold who both have been supplying quality products for over 30 years. We are the exclusive supplier and service centres of these products throughout Australia and New Zealand. What is different about OzCoolrooms & Winerooms compared to other suppliers? We only specialise in cool rooms and wine rooms for residential homes. We don’t supply to commercial. We don’t of do air conditioning and we don’t do coolroom hire. Our focus is to help our clients to create that extra WOW in their home with premium quality products. OzCoolrooms & Winerooms was established in July 1990 and celebrating 26 years of Cool living.